Three of Britain’s mainstream party leaders have temporarily abandoned their seats of power in Westminster to travel to Scotland. The trip is part of a last-ditch effort to sway Scottish opinion toward a ‘No’ vote in the upcoming independence referendum. Journeying separately and addressing different audiences throughout Scotland on Wednesday, Prime Minister David Cameron, Liberal Democrat leader Nick Clegg and Labour’s Ed Miliband will issue an impassioned joint plea to Scots to vote to remain a part of what they insist will be a reformed United Kingdom. In a joint public statement, the three leaders acknowledged that “there’s a lot that divides us” but emphasized that “there’s one thing on which we agree passionately: the United Kingdom is better together." In an effort to explain their motivation for abandoning prime minister’s questions to travel to Scotland, Clegg, Cameron and Miliband said they wished to listen to and speak with voters on the ground “about the huge choice they face.”“Our message to the Scottish people will be simple: 'We want you to stay,'" they added. But Scottish First Minister Alex Salmond, who has strongly advocated a ‘Yes’ vote in the referendum, described the trio’s decision to journey north as “the biggest blunder of the campaign.” He also suggested the Westminister establishment was “in a total and utter panic”as its campaign unravelled. According to The Guardian, several Labour sources claim the three leaders trip to Scotland was undertaken to issue an emotional plea to Scots to vote “No” on September 18, and also to counter Salmond’s pro-independence rhetoric and question how exactly Scotland might operate alone. As part of this collective bid to sway Scottish voters towards a “No” vote, Cameron made an appearance in Edinburgh, while Clegg was set to attend an event in the Scottish Borders. Miliband is scheduled to speak in Glasgow later on Wednesday. Whether Cameron, Miliband and Clegg’s strategic journey north will sway Scottish voters remains to be seen. Commenting on their joint venture, Salmond said if he thought they were “coming by bus” he would have sent the bus fare. Salmond denounced Cameron as the least popular Tory leader ever among Scotland’s populace, and said that Miliband was the most mistrusted Labour leader. Speaking in Edinburgh on Wednesday morning, Cameron urged Scots not to vote for independence merely to punish the “effing Tories”. He stressed “this is not a decision about the next five years, but the next century." Commentators suggest this unprecedented collaboration across Westminster’s divisive political terrain reveals a growing fear in London that Scots are not being swayed by potential fluctuations in the financial markets and warnings about permanent economic risks should Scotland become a sovereign state. The Westminster trio’s trip came just a day after Bank of England governor Mark Carney made the same journey. During his visit, Carney cautioned Scots that a currency union was simply "incompatible with sovereignty." The central bank chief categorically rejected Salmond’s argument that Scotland could become an independent state while sharing Britain’s currency. Carney’s perspective echoes that of US economist and Nobel Prize laureate Paul Krugman, who warned on Tuesday that an independent Scotland could face economic strife if it keeps the British pound. 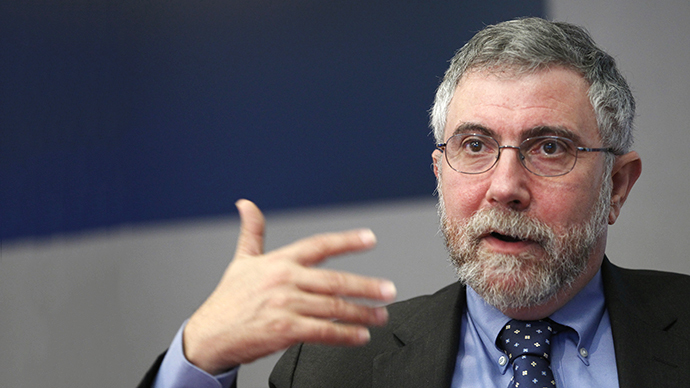 In his New York Times Op Ed, Krugman argued a combination of Scottish political sovereignty and a shared currency is “a recipe for disaster.” Meanwhile, Credit Suisse analysts have warned Scotland would face an economic crisis should it become independent, characterized by a deep recession. A spokesperson for the firm cautioned “deposit flight is both highly likely and highly problematic” if Scottish independence is secured. Nevertheless, support for Scottish independence is gathering momentum. A YouGov poll released on Sunday revealed the “Yes” side was leading 51-49 – the first time it has been ahead since the campaign was launched. A recent surge in support for Scotland’s pro-independence campaign has rattled both the City of London and global financial markets, prompting a 3.5 percent slump in the value of the pound over the past four weeks. 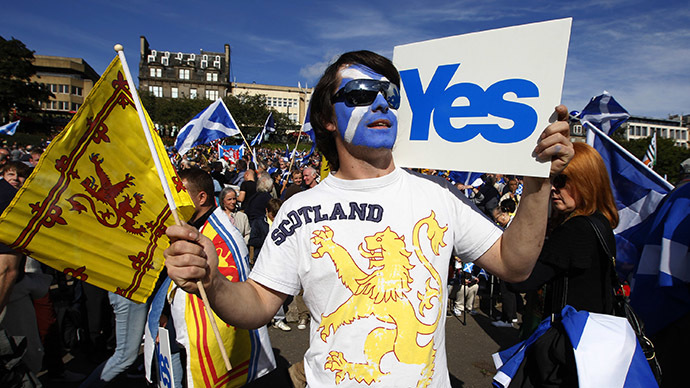 As a result, the ongoing Scottish independence debate is being watched closely by financiers in London and abroad. Some of the world’s largest global banks have warned an independent Scotland could reap disastrous economic repercussions for the United Kingdom. 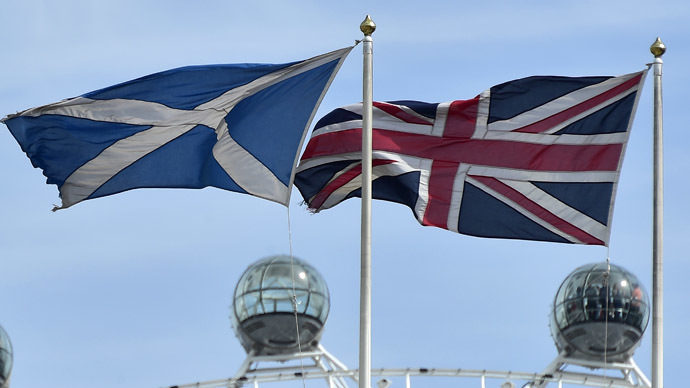 Deutsche Bank, Societe General, JP Morgan, Barclays, RBC Capital Markets and Credit Suisse have all issued negative predictions about Britain’s economic fate should Scotland become an independent state. 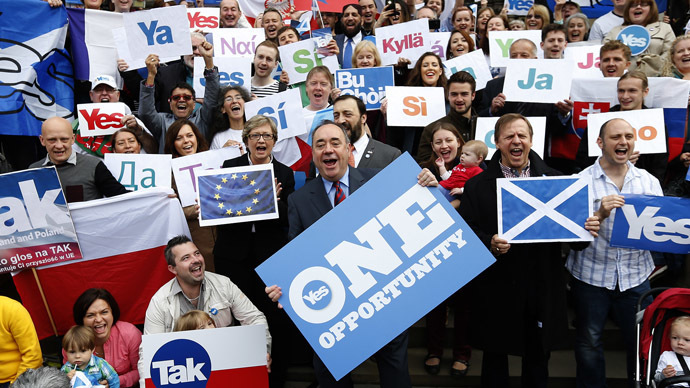 Many commentators have expressed concern an independent Scotland could severely compromise Britain’s national interest. Former UK Prime Minister Sir John Major warns Britain’s standing on the global stage would be “diminished” should Scotland become independent. Writing in The Times, he expressed hope Scotland would not break away from the UK, cautioning such a scenario would compromise the UK’s leverage in the international arena, within the European Union and within the United Nations. “If the UK lost Scotland it would be diminished – be in no doubt about that. Our defence would be severely weakened. Trident would almost certainly be lost. Britain’s role as the second largest military force in the EU would be gone and, with it, many of our close ties to the United States,” he added. Should Scots vote for independence, Britain and Scotland would engage in an 18-month period of negotiation on core strategic and economic issues such as oil reserves in the North Sea, Scotland’s deployment of the British pound, Britain’s controversial nuclear submarine base in Faslane, and an independent Scotland’s relationship with the European Union.